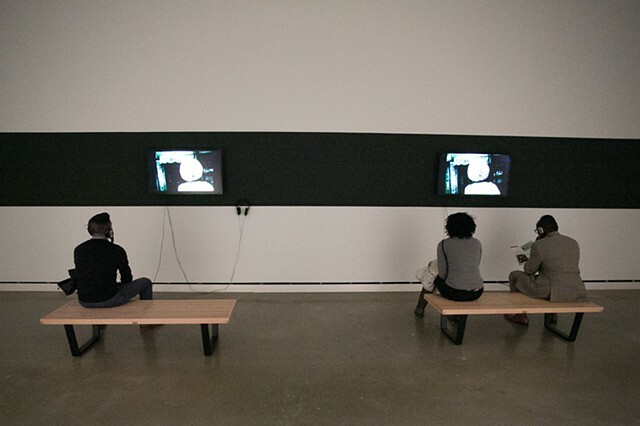 The solo exhibition Existential Crisis showcases the captivating filmography of contemporary filmmaker Akosua Adoma Owusu. Owusu's uniquely visceral style of filmmaking and storytelling possesses a rhythmic quality that allows viewers to experience and internalize the subject matter in a hyper-hypnotic way. Her films incite feelings of anxiety, discomfort, separation, peace or reconciliation, invading and coercing the viewing experience. These films embody the artist’s response to a current culture where she finds herself suspended in a never-ending existential crisis, moving through the world as spectacle. She is, at once, “too” Ghanaian in America and “too” American in Ghana, she seeks to locate a space between the two worlds that she can call home. Much of Owusu’s works address a collision of identities, where the African immigrant located in the United States has a triple consciousness. The triple consciousness is experienced as; in the African diaspora having to assimilate to white American culture in order to succeed in American society; the African immigrant often being grouped and identified with African Americans in the eyes of others, mostly due to a shared skin color; and many Africans not necessarily identifying with African American culture and history; their distinct culture rendered marginal.